Do You Beleive The Lie? Slung over the arm of the couch with my bare feet swinging, I sat reviewing my 3rd grade report card with my dad. My dad said, “Good job Sis!” My teacher had told my dad that I was very bright, but very scatterbrained. He told that story to me and chuckled, I giggled too, but it stung just a little. I remember that lie, like yesterday. Not that I needed years of therapy or resented my father or my teacher, but that little lie is like tiny streaks of water on a sandcastle destroying the delicate shape. The truth is I have an attention problem. I am fascinated by so many sparkly things in every direction. I notice everything! If one really catches me, I can dial in. They probably would have labeled me with A.D.D. if I grew up in this generation. We all have lies we believe, “you’ll never amount to anything,” “You’re such a liar,” “Your sister never did this,” “You should be ashamed of yourself,” “You can’t hold onto your money” “You deserve what you got, “or anything with the words “always” or “never.” I don’t know what your lie is, but we need to identify, search out and replace it with truth. Lies come from a place of frustration and the slip of tongue most of the time, rather than from someone who has actually thought about steering someone in the right direction and carefully chose their words. Yet...we take that lie out of the box now and then and believe its power. I find it no coincidence that the Devil, himself is called the Father of all lies. Here’s a few things I know about believing lies after watching people live and if I’m honest, with even myself. · Believing a lie shuts down productive living. After all, if you “always” act a certain way or “never” do something right then why bother? · Believing a lie, clouds the truth. If I told a friend she looked fabulous, but she believes the lie she is fat, she’ll never believe the real way I see her. · Believing a lie controls our actions. “Nobody ever listens to me, or no one understands me.” You can watch a person overtime begin to shut off their feelings and communication because they believed the lie. 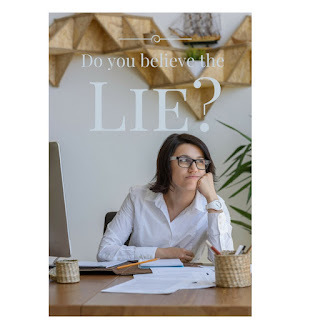 · Believing a lie produces shame and guilt. Do we really deserve all that happens to us? (I’m not talking about consequences) Or is it because we live in fallen world and bad things can happen to good people. · It can set you free - (John 8:31-32) I need that daily. · It leads you to the Father (John 14:6) Oh how I want to know Him more and more. · It teaches us how to live (Psalm 25:4-5) Finally, Someone to tell me how to do life! · Love rejoices in it (1 Corinthians 13:4-6) Who doesn’t like happy love? · Grace seems to always accompany truth (John 1:14) We can’t have enough of that in our lives. When I read about the truth of the word, I realize that I am not scatterbrained and I do have the ability to stay focused. I am not stupid but empowered to love and do many things all at once! Not everyone can do that! You see how a little act of truth goes such a long way. When you hear that little lie in the back of your head taunting you to give up, or believe it and shut life off, apply Truth to the situation. What does the Author of all Truth have to say about where I’m at? I bet He has lot to say about you and me AND He’s not frustrated and not just throwing out His words. His words are intentional and kind and cause us to grow.